Pope Francis’s performances and writings give a picture of a man that is two-faced. To build a public image for himself, Bergoglio, once elected, chose the name Pope Francis in honor of St Francis of Assisi. St Francis was known to be a softhearted lover of nature; thus, Pope Francis adroitly implied that he would be similarly unassuming, kind, and harmless. Then following his election, he paid his own hotel bill for his stay during the enclave. He then took up residence, not in the usual papal apartments, but rather in a smaller more humble suite. On the other hand, from his first speech and subsequent presentations, he has shown himself as a totalitarian dictator. Thus, as the media and many ecumenical Evangelicals fawn over Pope Francis, it is necessary to biblically analyze his speeches and performances. The mind boggling conclusions are documented in the following article. In the sixteenth century, the Reformation, through its emphasis on the ultimate authority of the Bible and the Gospel of grace, began to dislodge the Papacy from its position as co-ruler of the Holy Roman Empire. The truth of Scripture and the Gospel gave men and women the knowledge and courage to stand up against the Inquisition, a system of tortures by which the Papacy had enforced submission to papal dogma. This enforced submission had given the Papacy the power to wield tremendous influence with the emperor and among the kings of the empire. Thus Ignatius of Loyola, a contemporary of Martin Luther, founded the Jesuits in 1530 for the very purpose of defending the Papacy from further loss of its power base. The Jesuits’ objective has always been to increase the temporal power of the Papacy to align with the Roman Catholic dogma that the Pope has the right to judge, “the highest civil office in a state.”1 However, since the demise of the Holy Roman Empire in the late eighteenth century, the Papacy has had no civil authority by which to enforce obedience to its moral rulings. It is a well-established fact that the Jesuits throughout their history have caused many serious disturbances by their nefarious schemes within the civil governments of many countries. Over the centuries, they have justifiably earned their reputation as troublemakers to the extent that they were denied residence in some nations for varying periods of time. Nevertheless, their objective of increasing Papal religious and civil power beyond its previous height remains unchanged. Therefore, in order to move forward the Papacy’s drive for power in the current religious and civil arenas, this Jesuit Pope must efface the historic image of the Jesuit Order. 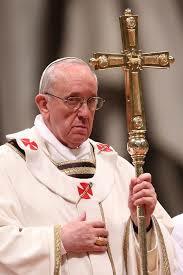 Once Jorge Mario Bergoglio was elected, he chose the name Pope Francis in honor of St Francis of Assisi. St Francis, known to be a softhearted lover of nature, was also known for his humility and gentleness. Thus, in building an image or persona for himself in the public eye, Pope Francis has shrewdly implied that he would be similarly unassuming, kind, and harmless. Since there has never been a pope named Francis, the name carries with it no papal baggage. Immediately following Pope Francis’s election, the media made much of his unassuming nature by showing him paying his own hotel bill for his stay during the enclave. This was followed with news that he was not going to take up residence in the Vatican’s usual papal apartments, but instead would take a smaller, more humble suite, ostensibly to live a “normal” life in touch with the laity by being visibly among them.2 Further, he graciously welcomed back into the Vatican the previous pope, Benedict XVI, who under rumors of unpleasant circumstances, had abruptly resigned. Was this not the modern St Francis, kindly restoring to the aged and ailing Benedict some remnant of the honor that had so suddenly departed him? The steady stream of these and other similar public appearances continues to craft the optics into an image for the new pope that is the anti-type of the traditional Jesuit. However, in the very first sentence of his inaugural address on March 19, 2013, Pope Francis presented a feature very different from the persona being carefully groomed by the optics. 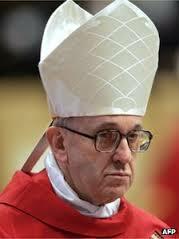 Indeed, even as out of the heart the mouth speaks, so the new Jesuit Pope began to display audibly his genuine image. While thousands of people were crammed into Saint Peter’s Square, and millions across the world listened by television and radio, the new pope stated, “Dear Brothers and Sisters, I thank the Lord that I can celebrate this Holy Mass for the inauguration of my Petrine ministry...”3 Francis knew the claimed power that is embedded in the term, “Petrine ministry.” As the official Catechism of the Catholic Church states, “...the Roman Pontiff, by reason of his office as Vicar of Christ, namely, and as pastor of the entire Church, has full, supreme and universal power over the whole Church, a power which he can always exercise unhindered.”4 It is highly significant that Pope Francis began his speech by thanking the Lord that he could celebrate Mass for the inauguration of what he said was “my Petrine ministry.” His opening sentence shows where his heart is; namely, in himself, in his position, and the power entailed in such a position. It is this particular idea, i.e., that the Pope is the Apostle Peter’s successor, which has been the undergirding authority for the Papacy’s identity in the world since the time of Pope Gregory VII in the eleventh century. The nature, indeed, the very identity of the Office of the Papacy of the Roman Catholic Church is at stake. Thus, the Papacy will concede nothing regarding this claim but rather use it to establish itself as the stable institution in the midst of current tumultuous times. Let us protect Christ in our lives, so that we can protect others, so that we can protect creation! The vocation of being a “protector,” however, is not just something involving us Christians alone; it also has a prior dimension which is simply human, involving everyone. Notice the position to which the Lord Jesus Christ has been relegated in all this. Rather, by weaving together the choice of papal name with the theme of protection as his opening homily, Pope Francis has made it clear that he intends to protect the Papacy and its social objectives during his term of office.11 The fact that he has said it in gentle terms, by calling on the images of Francis of Assisi and Joseph, Mary’s husband, does not make it any less lethal. Thus, it was on day of his inaugural address that Pope Francis began his Pontificate with the mark of a true Jesuit, i.e., primarily defending the Papacy against the Gospel and biblical truth at all costs. With the very opening of his pontificate, the true image of Francis was brought forth into the light of day by his own words, showing him not as humble and harmless, but as proudly dogmatic and utterly opposed to biblical truth. From these remarks, Pope Francis has demonstrated effectively that he will not protect the truth of the Scripture and the Gospel of grace. He does not believe in the Lord Jesus Christ as revealed in the Bible alone. It is a well-known fact that Allah, who the Muslims worship, is not the God of the Bible. Since Pope Francis must know this, his remarks point to his ecumenical objective, a goal to be accomplished by high-powered flattery and false ecumenical dialogue. In his address, Pope Francis emphasized the fact that the Pope is known as the “pontiff,” or “a builder of bridges,” and stated, “In this work [with governments], the role of religion is fundamental.” While few people realize it, the Pope claims the right to judge those who hold highest civil office in a state. This blending of things civil and religious has been the papal method of operation throughout the centuries. At the present time, the Roman Church seeks to implement her socialist ideas by using her power as a religious system working through her own status as a civil state. As a religious system, she is able to command a “fifth column” within many nations.14 By her influence as a civil power, Papal Rome is also able to substantially influence civil rulers and civil policy in many nations and international bodies. The Church of Rome has 179 legal agreements with nations across the world. These “concordats,” as they are called, guarantee that the Catholic Church has the right to define religion and worship for Catholics within that sovereign nation. They also secure for the Vatican the right to define doctrine, establish Catholic education, and negotiate laws regarding property, appointing bishops, and Catholic laws of marriage and annulments. The Republic of Argentina has had a legal agreement with the Church of Rome since 1957. Thus, as Cardinal Jorge Bergoglio in Argentina, he would have known well the benefit that the legal agreement meant to the Roman Church. In addressing the diplomats from governments that have a relationship to the Vatican, Pope Francis knew just how important it is to woo civil governments into legal liaison with Papal Rome. 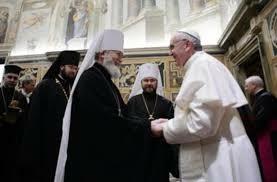 Thus, the new Pope continues the Vatican’s civil/legal relationships with nations across the world in its endeavor to move civil governments to implement its global socialist agenda. that Mother Church gives a person “Jesus”. The same truth has a grave warning for Pope Francis and all those who believe in the traditions and sacraments of the Roman Catholic Church rather than directly believing on the Lord Himself by the authority of His written Word. God is the same just and righteous God under the Gospel as He was under the Law in the Old Testament. He deals with us in love and grace; yet, He in Himself remains “a consuming fire.”29 He is the God of strict justice who will avenge Himself on all who have not received the love of the truth, but rather look to a church or some person other than the Lord Jesus Christ alone for life. The Lord Jesus Christ has lived the perfect life and, willingly of His own volition, has made the faultless, propitiatory sacrifice for sin. To refuse to believe in Him alone is a critical offense. When the Lord Jesus dealt with the sincere and devout Pharisees, He gave them a very strong word, “I said therefore unto you, that you shall die in your sins: for if ye believe not that I am he, ye shall die in your sins.”30 You may say that you are a good Catholic and that you want to please God in this present life and hope to live with Him forever; that is a noble goal. You may be as sincere and devout as the Pharisees, but like them, if you personally neglect to believe on Him alone for your salvation, you likewise will die in your sins. These objectives are listed in the “Compendium of Church Social Doctrine” and in the Vatican Council II documents on ecumenism. Radical Islam is doing essentially the same thing today as it demands the right to teach its people their religion, including Sharia Law, within the Western nations - regardless of the fact that Sharia Law contravenes the laws of the sovereign nations in which these Muslims live, even as the Papal socialist agenda contravenes the U. S. Constitution. Acts 16:31 Conditional: if his family believed in Christ as he is commanded to do, they too would be saved. Permission is given to copy this article if it is done in its entirety without any changes.